Before I get to a review of the book, a brief introduction for the benefit of those who may never have walked the hallowed acres of God’s own county. If you’re reading this in England you’ll probably be aware of Ian McMillan and you’ll certainly be aware that Yorkshire is unique. Not necessarily because it is better than other counties (though for a Yorkshireman this is a fact so beyond dispute as to be accepted as an acknowledged truth along with the Ten Commandments and the Rules of Cribbage!) or because it contains, in and of itself, something that is both quintessentially English, and a nationality all its own. All of this may or may not be true. 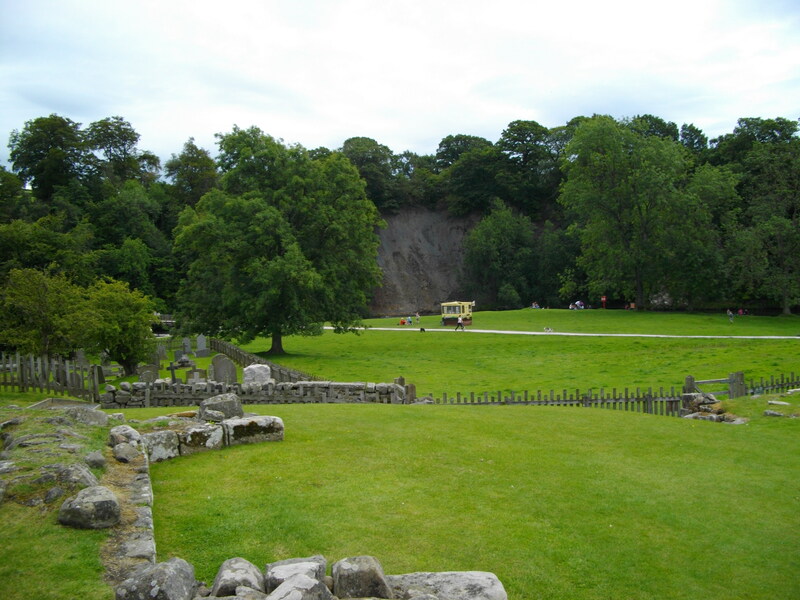 Yorkshire is the biggest of the English counties, the most culturally diverse and one of the most attractive. It contains extremes. Empty moorland, precipitous cliffs, wide sandy beaches, pulsing cities, mill towns that were once the cradle of the Industrial Revolution but are now suffering neglect and poor municipal decision making, wide fertile farmland and many lovely rivers. You’ll never be short of someone to point out your personal defects in Yorkshire. You’ll never be far from equal measures of free thinkers and bigots. It is a county of great writers: three Brontës for starters, great painters (David Hockney for one) and great musicians (Frederick Delius was from Bradford). It has given the world more than its share of pop musicians, actors and famously (at least in Yorkshire), if it had competed as a country in its own right, it would have come 12th in the medal table at The London Olympics with 7 gold medals, 2 silver and 3 bronze. People from Yorkshire are known to say things like “There are only two sorts of people in the world. Those who come from Yorkshire, and those who wish they did” and mean it. People from elsewhere have an oft repeated saying (loathed by Yorkshire folk) that “You can always tell a Yorkshireman, but you can’t tell him much!” Legend (purely apocryphal) has it that an old gentleman from Richmond North Yorkshire died and ascended to the pearly gates of heaven. “Where are you from then?” asked St Peter. “Richmond Surrey or Richmond North Yorkshire?” asked the saintly gatekeeper. “Oh dear.” said St Peter. “Is something wrong?” enquired the man. It is known across England as “God’s County” or “God’s Acres”. Again these are terms usually used by those born in Yorkshire. 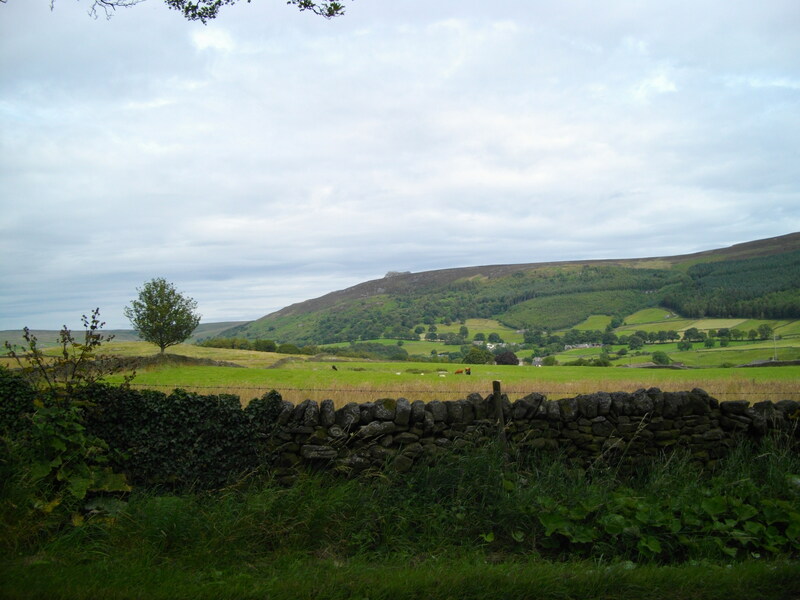 There is also a huge rivalry between Yorkshire and its western neighbour, Lancashire. Yorkshire was the centre of the wool trade. Lancashire was cotton. Yorkshire has Leeds, Sheffield and Bradford. Lancashire has Manchester and Liverpool. Yorkshire has Scarborough, the world’s first seaside resort. Lancashire has Blackpool which became one of the biggest and most popular. More than anything there was the Wars of the Roses. A long lasting series of fifteenth century civil war battles fought under the banners of York and Lancaster. Lancashire being the Red Rose County and Yorkshire favouring the White Rose. Both sides can claim victory or defeat. The conclusive battle of these Wars was the Battle of Tewkesbury (fought hundreds of miles away in Gloucestershire) and won by the Yorkists, which placed Edward IV (possibly Edward V) and certainly Richard III on the throne of England. Richard was eventually defeated and killed at the Battle of Bosworth in 1485 by the essentially Lancastrian armies of Henry Tudor (henceforth Henry VII). Henry married Elizabeth of York which combined both households and also combined the red and the white into the Tudor Rose which is half one and half the other. All of this gives grounds for rivalry until you look more closely at where the various armies came from. Geographical Yorkshire and Lancashire had very little to do with it. In fact the Yorkists drew many of their soldiers, generals and donors from west of the Pennines while the House of Lancaster had strongholds in God’s County. It’s all very confusing to anyone but a Yorkshireman. He doesn’t need historical facts to prove him right. Being right is something you are born with in the three Ridings. What about Ian McMillan? Well he’s a very well liked poet, thinker, broadcaster, playwright and educationist. He’s always lived in Yorkshire, speaks with the broadest of vowels, supports Barnsley Football Club and has an authenticity to be envied. He knows his stuff. But he also has a sly sense of humour and you can never be truly sure when he is defending Yorkshire with a straight bat and when he is playing with a great deal of the right hand side of irony. Ian McMillan: The Bard of Barnsley. Of course you can no more define Yorkshireness without stereotype than you can define Texan or Australian or Japanese. The book becomes an enjoyable series of excursions without any great attempt at anthropology or behavioural science. He loves Yorkshire. He loves being Yorkshire. He hates being told he makes a living out of being ‘Yorkshire’, but to a large extent he does. But he is very good at it. He’s a little way short of being a JB Priestly or an Alan Bennett in the pantheon of writers who were peculiarly Yorkshire but, if not a national treasure, he’s a Yorkshire treasure. This book wanders. This book meanders, as the poet goes on a search for Yorkshire and what makes it what it is. He looks for the epic in the seemingly trivial and often is in danger of the delivering a trivial epic. There are certainly long stretches of the book that show no evidence of the editorial blue pencil. At times it is difficult to distinguish McMillan’s search for meaning with that of his fictional Yorkshire neighbour, John Shuttleworth. Except McMillan is a storyteller and Shuttleworth a story; and Shuttleworth often that bit more believable. McMillan is certainly guilty of making up a lot of his anecdotes (so it seems to me) or liberally refining them to suit his purpose. The body language of his prose as much of a giveaway as a Yorkshire batsman taking a close interest in the crowd after the ball snicks his bat on the way to the wicketkeeper’s gloves and the umpire’s finger stays down. When he stops waffling he is suddenly very good indeed. And very funny. If you go and see him perform he’ll delight you, make you laugh, a lot. I’ve seen him several times and will go again. And he makes you laugh here when he hits the nail on the head. When he stops trying too hard to be “The Bard of Barnsley”. When he stops embroidering his prose with rich homely similes or dropping in a fancy poetic term (about every seventeen pages) to prove his bona fides. To point out the many contradictions in the text is to point out what is meant. Yorkshire is a contradiction. It’s the ugliest county and the most beautiful. It isn’t posh but has some of the most unbearable snobs on God’s earth. It’s got local hairdressers where you can have your arse bored off by the same conversation every time you pop in for light trim. It also has some of the country’s most respected universities. A place where you can confuse ordinary people for characters and characters for ordinary people. And it’s true and honest. But what would I know? I’m a Lancastrian. I like his search for a perfect pork pie. I like his search, with poet Steve Ely (a very different type of poet; stronger, grittier, more complex and with something that truly captures what it is to be Yorkshire) for the poet Ted Hughes. I’ll be off to Roche Abbey very soon to sit by Laughton Pool and read his poem ‘Pike’ in the likely knowledge that I am at the very spot where it was inspired. I like the parts of the book where he tells the story of his journey simply and without the cap and bells of poetic device or rambling anecdote. And I like these parts of the book enough to overlook the parts of the journey when you want to shout “Are we nearly there yet?” or “Gerron wi’ it!” It’s like being in Yorkshire. Lots of grit and grot but when you look up, a glorious old mill or a castle on top of a hill and the sun coming out from behind a cloud. I’m not sure that extended prose is McMillan’s strong point but he has an undoubted love of words which is infectious. He’s charmed and entertained audiences for 35 years without ever saying a great deal. And that is a strength. Some might say he’s got away wi’ it. Managed to have a good life without ever having to get a proper job. He doesn’t like being called a professional Yorkshireman but he wears the badge with pride. I kept thinking the book “were going on a bit” but now I’ve finished it I’m beginning to miss it. Pinning down what makes it good (and it is good) isn’t easy. Like Yorkshire itself. If I’m going to take Jolly on a trek then I need the practice as much as she does. Once underway we’ll be fine. I can never remember worrying very much about little things like what to eat or where to spend the night when I’ve been off on a journey in the past. At least not after the first couple of days. But normally I’m on my own. With a dog I want to try out some routes and check out campsites and other possible places to pitch a tent. As well as getting her used to walking on open moorland for many hours a day often through livestock, we are planning out the early stages of a possible route. I have a fancy for combining the five great attractions of Yorkshire. (Pennines, Dales, Vales, Moors and Coast.) If the Tour de France can explore the county then A Lancastrian walker and a Yorkshire dog can do the same. We plan on starting in the Peaks but hope to get onto the Pennine Way after a few days. This should take us up the “backbone of England” and along the wild exposed moors. Once we’ve passed the famous sites of mass trespass, the fast flowing streams that powered the industrial revolution, the moorland world of the Brontes and Malham Cove we intend to take a few days crossing the Yorkshire Dales. I quite fancy an amble down Wensleydale but I could be equally happy exploring Wharfedale or Swaledale. Twenty miles of flat farmland with monasteries follows. This is Herriot Country and with Sutton Bank ahead we should find ourselves on The North York Moors. Once we’ve crossed these we come to my favourite stretch of coast. The whole walk should end in Scarborough and if we manage that in less than three weeks I should be very much surprised. If we manage it at all I shall be more than proud. She’s had a rotten start to life and even though she is happy and full of fun most of the time, it doesn’t take much to remind her of when things looked bleak and cruel. Like most of us she needs love and attention. She needs calm, patience and she needs to be kept busy and stimulated. She is much the cleverer of the pair of us. We both need a challenge. We plan to celebrate being retired (she is a big reason why I chose to take the pension) by setting off in September. The moors and campsites will be quieter and we can gloat like anything every time we pass a school. Not that there are many schools on the route we’re planning. These are very early plans. They’ll change as I see difficulties or opportunities (often the same thing) and by September we’ll be planning something altogether different. The planning is half the fun. Today we walked along some more Derbyshire gritstone edges. The sun shone at its best in the morning and we caught the best part of the day. I’ve got the route planned now from Newbold (in Chesterfield) to Grindleford. In the next week or so we’ll find the best way to follow the River Derwent up to Ladybower Reservoir. After that we will be in the heart of the dark part of the dark peak. I can’t wait. 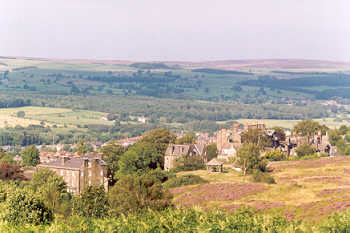 Twenty per cent of the population of Ilkley are retired. A further 14% are involved in education. And the town is in Yorkshire. Was there ever a stronger recipe for a town that knows it’s right and is going to point out why you are wrong? It’s also one of those strangely wealthy towns that Yorkshire keeps quiet about. Yes, it boasts about Harrogate and its splendours. This is where the Bradford millionaires hung those silk hats. 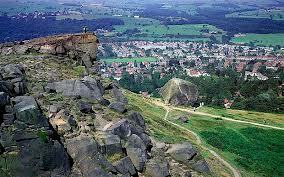 Ilkley though, like Otley, Malton and Northallerton is dripping with cash and the secret is largely kept in-house. Cars used to be an indication of wealth but the boom in over sized vehicles has now added the prestige motor to the growing list, Burberry and Pringle have long been victims, of status symbols that no longer confer status. The polished pride and joy outside the average Ilkley house is as likely to be a Fiat 500 as a Mercedes. Mini Coopers are popular but there are still plenty of lane blocking four by fours which give drivers such advantages on the well ironed Yorkshire roads; especially on the four days when it snows. Shops are what separates Ilkley from its poorer neighbours. As the crow flies, we’re only a few miles from Bradford and Keighley. In terms of living standards, and what middle class people like to call quality of life; there is no comparison. Asda, Sainsbury’s and Morrisons may clamber for space to trade to the south but here in Wealthyville we’ve got Booths. I don’t have a problem with this. I come from Cumbria (taking a 1974 boundary change into the reckoning) and we’ve got lots of Booths up there and a very fine supermarket it is. Booths outshines Waitrose when it comes to quality and provenance. You cannot go in and not buy something rather special and probably quite local. Lishman’s is a butcher of some renown, but when you consider that much of that renown was conferred by the self-proclaimed food hero, Rick Stein, I’d give it a go before you make up your own mind. I did; it’s very good. Betty’s only have tearooms in five towns and Ilkley is one of them. Of course, in a town with so many current and retired teachers, there’s a bookshop, and an independent one at that. Groves should survive the threat of Amazon better than most. This is a town to be seen with a book in a tearoom or coffee shop. I may sound mocking. I’m not. I don’t much care for the snobbery that is rife around town but, as far as being a centre of independent shops, I’d not only praise Ilkley, I’d go as far as to recommend people go there and have a very nice day out. 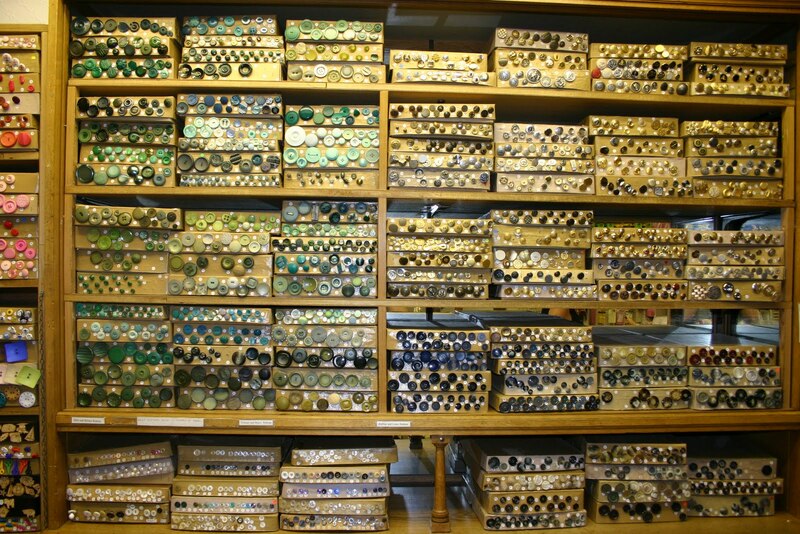 Duttons for Buttons makes the journey worthwhile on its own. I have some tea and cake at a nice tearoom a little out of the centre. Make a note that Darwin is celebrated as belonging to the town, though I can find no record of him doing more than staying in the local spa at Ben Rhyding for a few days. Grantham keeps quiet about a similar link with Tom Paine but Ilkley pushes the Darwin link quite hard. The cycle shop is another of the new wave emporia where fashion seems to outweigh matters mechanical. I want brake blocks. The assistant tries to sell me designer blocks for £12. Who on earth cares what their brake blocks look like. He eventually sells me some without a prominent brand name. I crave a cycle shop where you get served by someone who knows about bicycles and who sells you what you need rather than what they want to convince you you need. I crave Edison’s Cycles back in Clowne. I’ve enjoyed my stay but I’m more than happy to leave. There’s a cycle route past the golf club. This means having to avoid a mixture of large cars being driven by small men in diamond pattern jumpers who can barely see over the steering wheels, and the spandex and lycra squad balancing their over sized backsides on ultra lightweight mountain bikes. It’s the start of Wharfdale and I’m accompanied by them for the rest of the day. 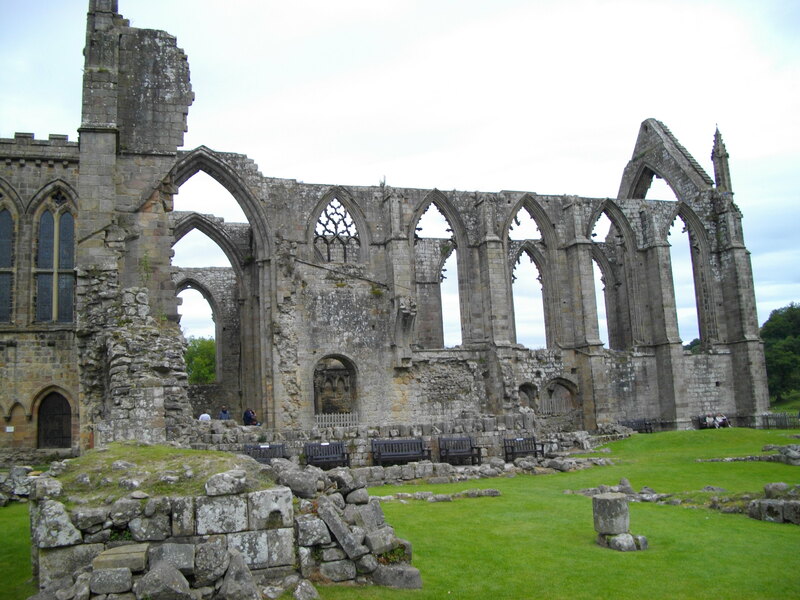 Bolton Abbey is a real treat. Coming over the moor has been enough serious exercise after yesterday’s exertions. The man on the car park is getting real pleasure out of charging every passenger and every driver. He seems an awkward customer but is actually just anti-car. He waves me through and tells me a good place to fasten my bike. The next two hours are among the best I’ve spent all year. 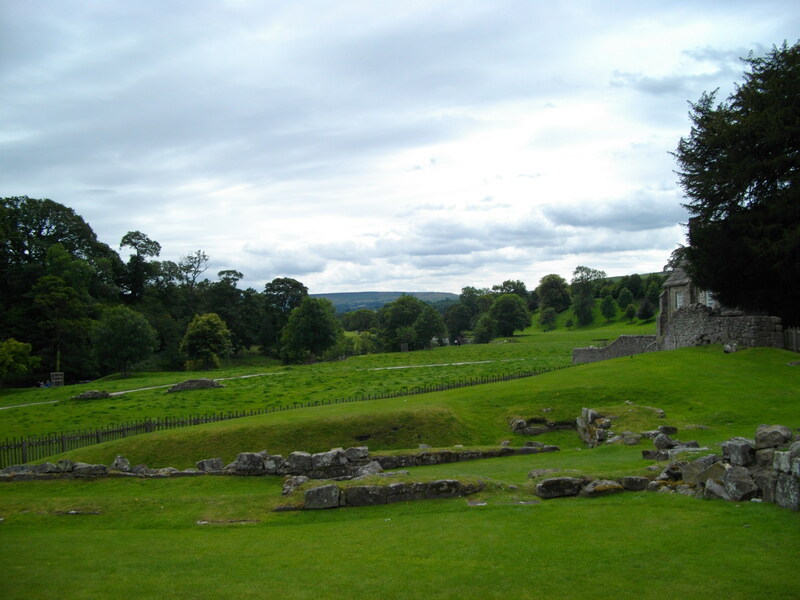 I let the shop sell me an ice cream and then I wander dutifully around the ruins before laying myself out on the grass and reading sixty pages of The Old Wive’s Tale. It seems a very Alan Bennett place to be, and Arnold Bennett would probably be his choice of novel for the location. I’ve been reading the odd chapter but this proper read introduces me to Constance and Sofia and they’ve been with me ever since. If I recommend a day out in Ilkley, I definitely recommend reading as much Arnold Bennett as you can manage. Treat yourself to one of his excellent smoked haddock omelettes sometime as well. The one peculiarity of the cars in the dale is their travelling in convoy. They are obviously locals, in that they live in the valley. They have chosen to leave their native land to find peace and quiet, rest and repose in the countryside. To discover a slower way of life that taps into the centuries old traditions of the dale. And then they drive as fast as they can on the bumper of the car in front of them. For me, it gets cars though in clumps and then leaves a few minutes of having the road to myself. It seems a fair pay off. I want to detour to Appletreewick because I haven’t been there before and, as well as Mark Wallington setting part of his wonderful Missing Postman, there, it’s also called Appletreewick and ought to be visited for that reason alone. I decide to stay on the main drag and tick off the miles to Kettlewell. I rather regret the decision. The road was fine and increasingly brought back memories of a week looking after a hostel up here. It could be a while though, before I get another chance to say I’ve been to Appletreewick. The locals call it Appletrethick. I think this a mistake. The town does have the strange claim to fame of being the place in Britain you’re most likely to receive a friendly gesture from a motorist. I wonder if these are the same motorists who are giving me all of two feet clearance as they fizz past.